Well, this was it. 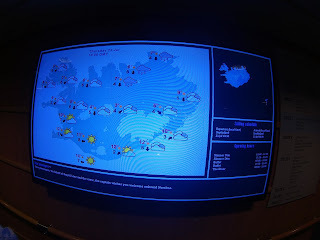 Iceland, the home of project's ultimate destination, was upon me. 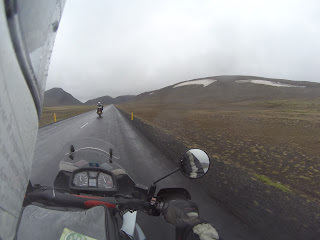 Prior to going onto the ferry I had already come into contact with Giuseppe - a fellow biker from my hometown of Rotterdam, who coincidentally was also traveling to Iceland in the same period. 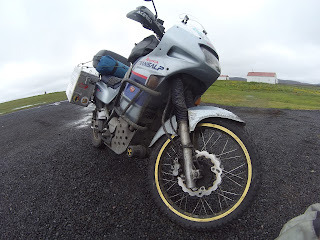 He'd read the story on ADVrider, and we'd met to discuss travel plans months before departure. We had agreed to keep in touch, should our paths possibly cross. 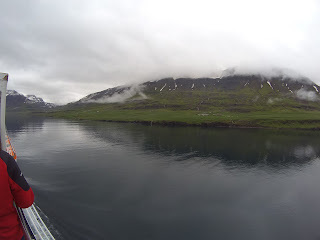 As it turned out, he was on the ferry that passed by Tórshavn on the exact day that I was to ride onto it, ergo: we were going to be on the same ferry sailing into Iceland. 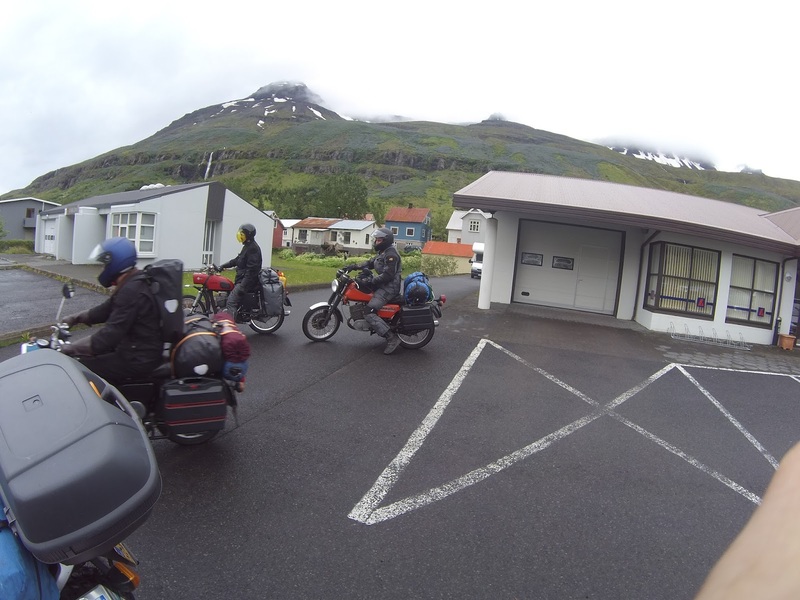 The nice thing about being on a boat with that many bikers to a country like Iceland, is that immediately there's an exchange of possible destinations and the like. 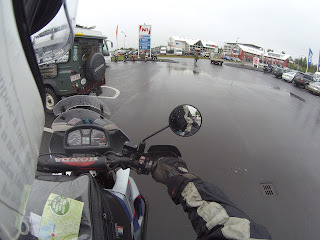 Reto, the Swiss guy with the Cagiva, talked me through some of the recommended destinations, which I promptly saved into my phone for future reference. I chose to adhere to these goals on the trip - the way I saw it, anything extra would be a bonus, but not worth taking any extra risks for. You see, traveling alone on a motorbike by itself is a risky business of which I am well aware, but nevertheless I was strongly adviced not to venture onto the F-roads (or 4x4 mountain roads) in the center of Iceland by myself, because if something were to happen, it could take days for anyone to find me. 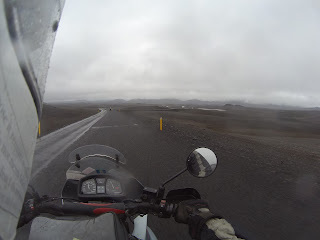 I reckoned that for my list of missions in Iceland, the F-roads were not necessary. If circumstances permitted I would perhaps try, but I surely didn't feel obligated to do so. 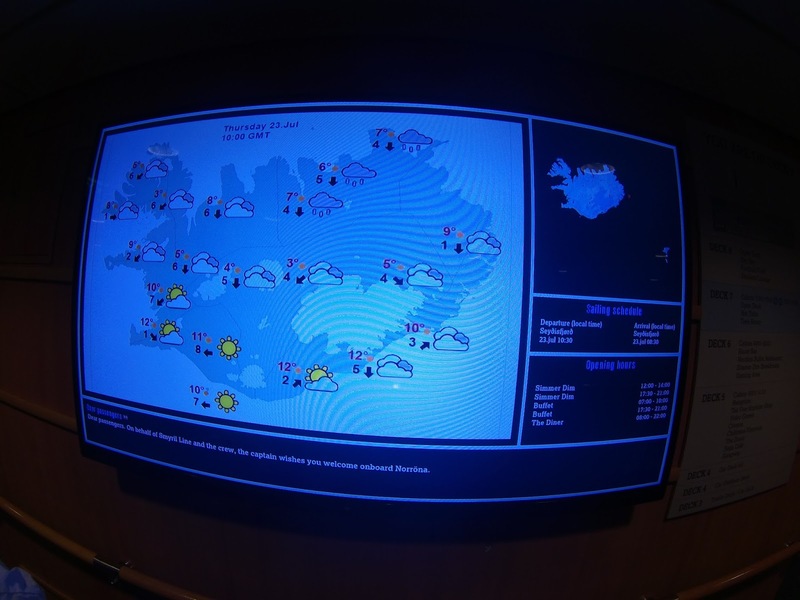 Now, on the ferry they have screens in the hallways that show you - among other things - the current position of the ferry (top right), and the weather forecast for Iceland on the day of arrival. 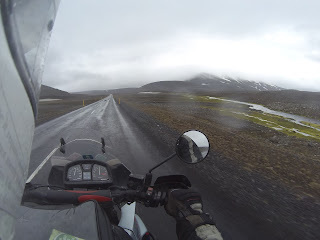 We would arrive in the East (pretty much at the cloud on the far right of the map), so immediately there was a choice to be made for all the bikers on board without a set travel route ; are you going to head North into the rain, or South towards the sun? 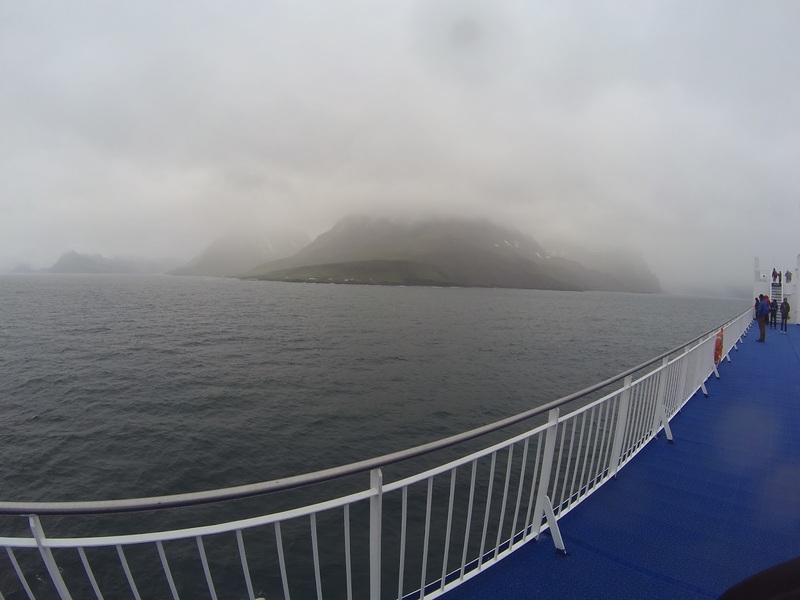 In the meantime, Iceland saw fit to make a grand entrance, and started the fog machines. 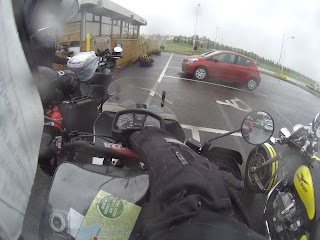 Now, the waiting for disembarkment is usually agony, as it takes ages for the crew to open the cardeck so you can get back to your bike and gear up. After a few hours, the most glorious words ever to be spoken through a ferry's intercom glared through the busy hallways. "Ladies and gentlemen, the cardeck is now open"
Time to head on down, and get going. 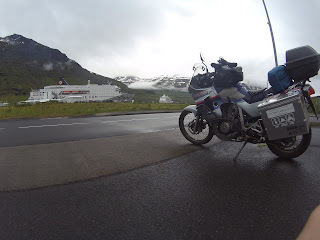 Ofcourse, it took a while for me to get ready - I had once again screwed up the ratchet strap and it was now stuck, so the Belgian next to me kindly offered to free the Beast. The sense of accompishment was already palpable, but I reckoned first and foremost that this was the point the trip would actually begin. 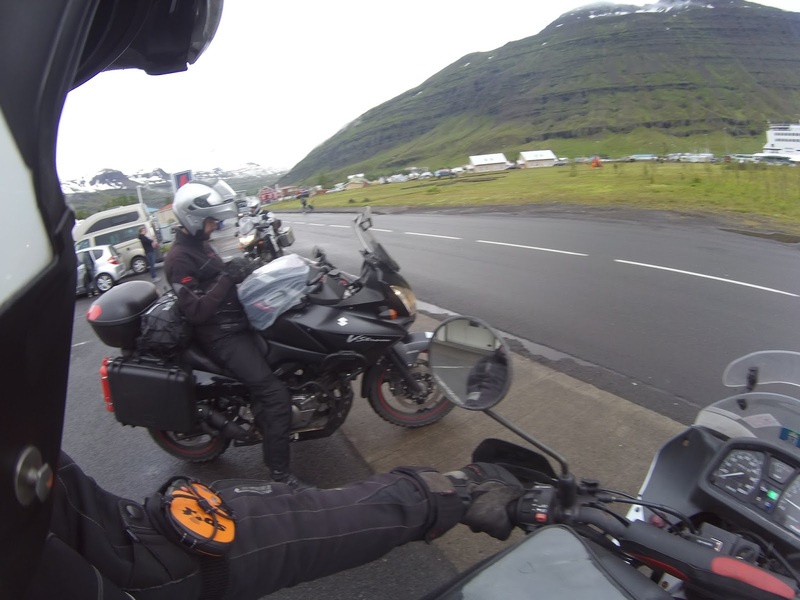 I had agreed to meet up with Giuseppe after disembarking, and ride to Egilsstaðir together. After a few minutes on the parking lot these guys piped up; three Germans on classic 250cc motorbikes, showing to all of those countless people on big 1200s that they were doing it all wrong. 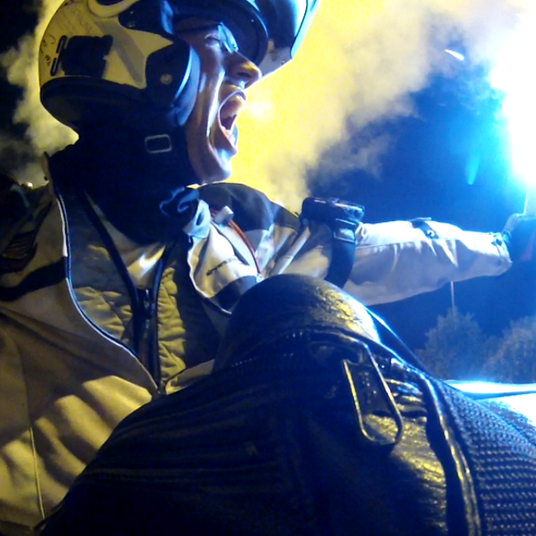 It was one of the coolest things of the day, for sure. When Giuseppe arrived, it was time to get the first Icelandic miles under our belts. 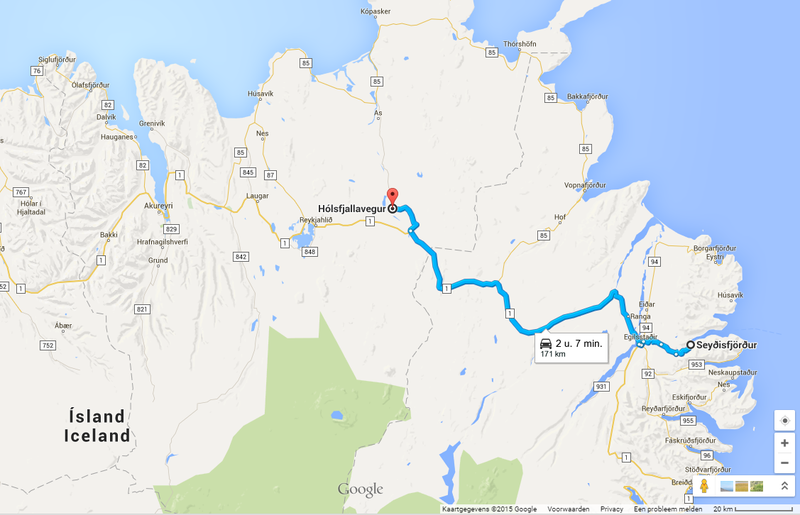 You see, there's only one road leading into Iceland from Seyðisfjörður, which ends at the town of Egilsstaðir, where all travellers would be split up. First though, everyone has to traverse a mountain pass. ...and a nice moisturizing descent! ... or, in our case, just some warmth and sustenance. The carpark in front of the restaurant illustrated what kind of a country we had just come into. Most regular cars were dwarfed by the customized Icelandic ones. 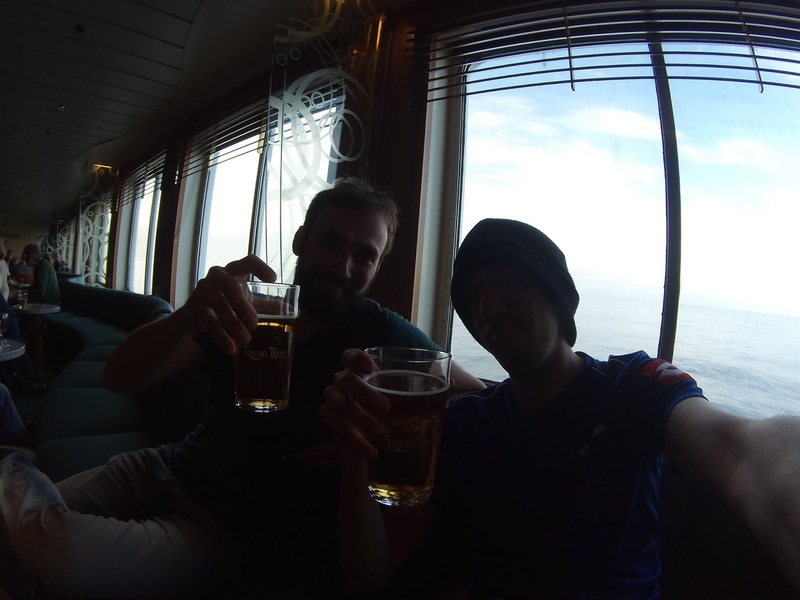 Giuseppe and I talked about destinations, and as we both have a different riding pace, agreed to keep in touch of our whereabouts. 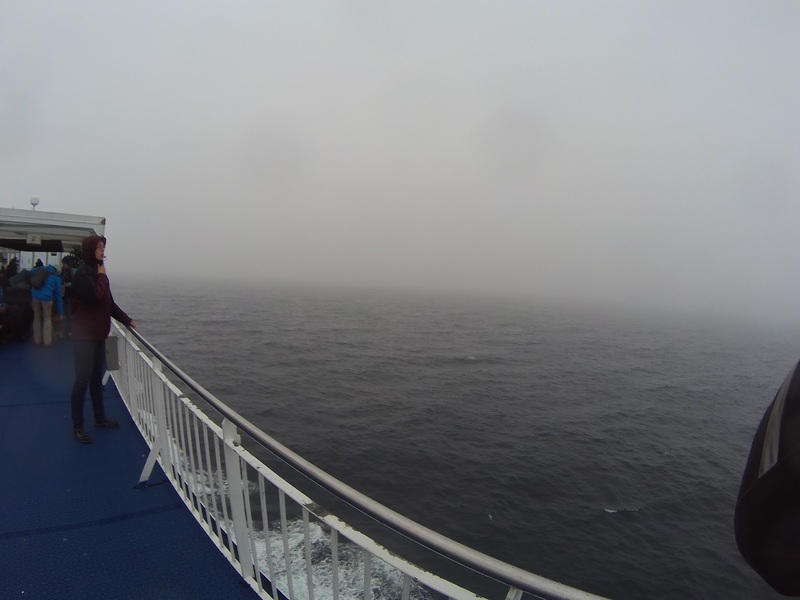 And then, it was time to head off into the big unknown. It felt extraordinary doing the first kilometers by myself, out in the open. 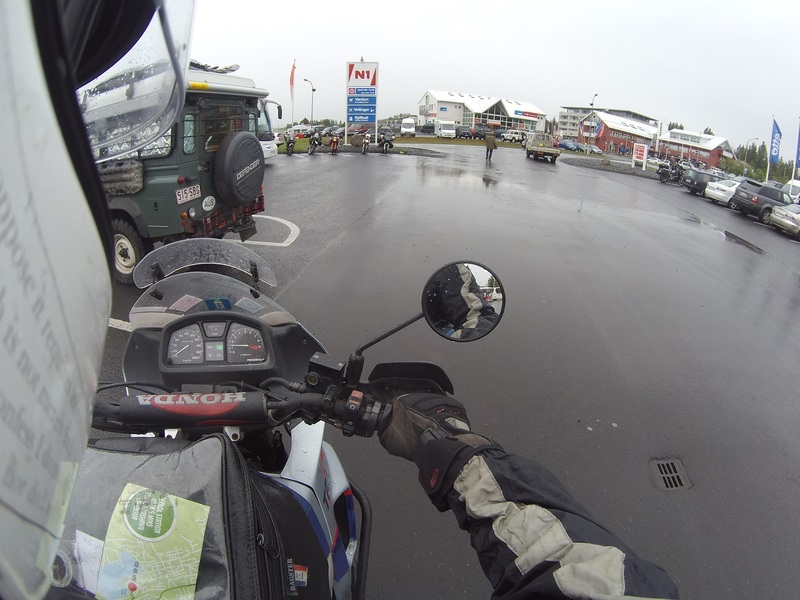 Sure, it was rainy, but being Dutch, I can handle rain just fine. 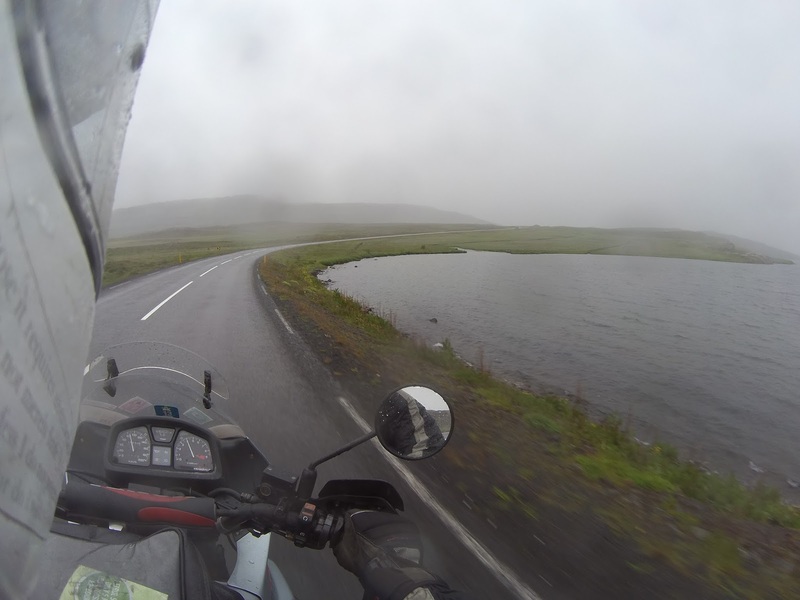 The tricky bit, I thought, was the wind, which exploited every little seam that was unprotected. Iceland, in the mean time, slowly but steadily started giving me a few peeks into what was awaiting me further down the coming weeks. 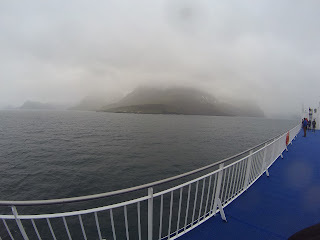 So far, it really reminded me a lot of Scotland. Sweeping roads through beautiful hills, with extraordinary views at the other side. 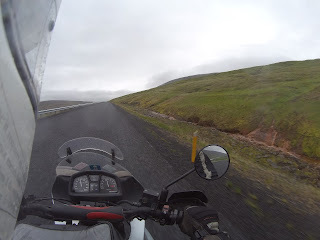 I also immediately got a taste of what I started to call 'cheesegrater tarmac' a few days later. 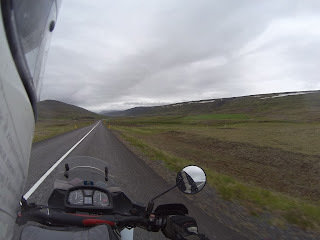 This kind of asphalt has the appearance of being a gravel road, but all the little stones are cemented in place, giving the road such an extremely rough texture that you hate to think what would happen if you were to fall and land on it at speed. 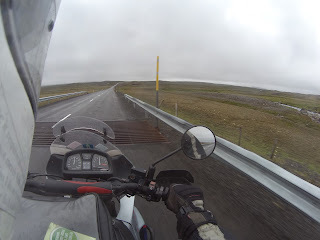 Being a country with quite a lot of sheep roaming free, you also can't miss these: cattle guards. 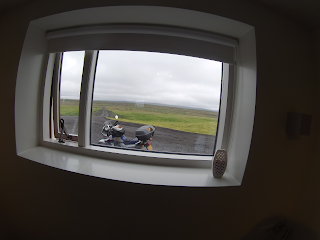 They are everywhere, and with the weather as rainy as it was, these required a bit of vigilance too. Cattle guards are a lot like train rails - as they are made of metal, they become highly slippery when wet. 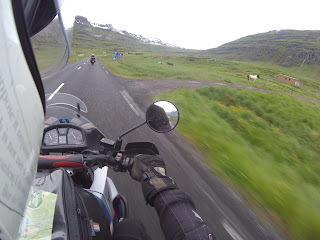 Not a problem in a car, but on a motorcycle they surely can be. 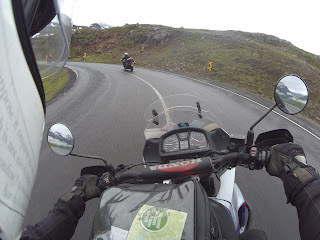 One time there was one in the middle of a bend, and with me not approaching it at a fully right angle , the entire bike briefly lost grip, skidded across, robbing me briefly of my balance and giving me a small heart attack in the process. The scenery just progressed on and on. 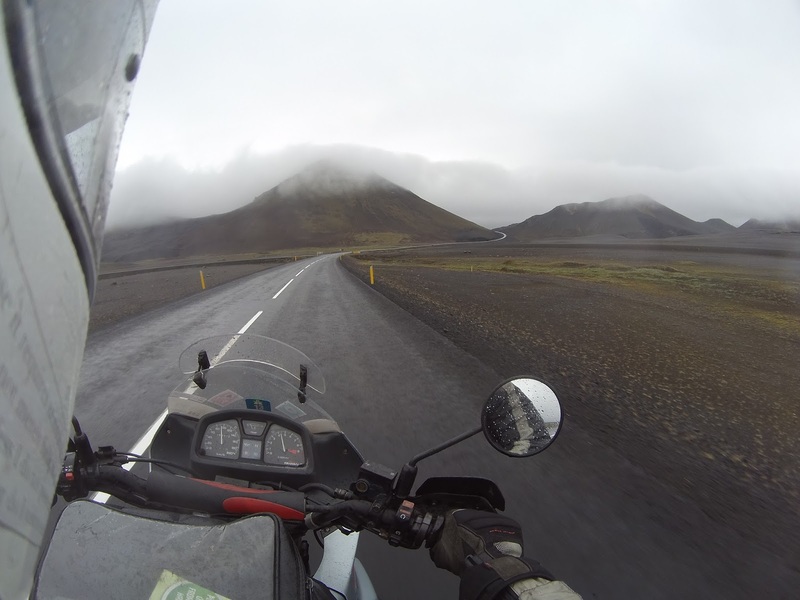 I marveled at how these mountains were engulfed in clouds, it just looked surreal riding past it. Like you've become part of a painting. I still took regular breaks, but progress went rather well. What also become apparent to me was that, save this couple on a BMW, I hardly saw anyone from the ferry anymore. 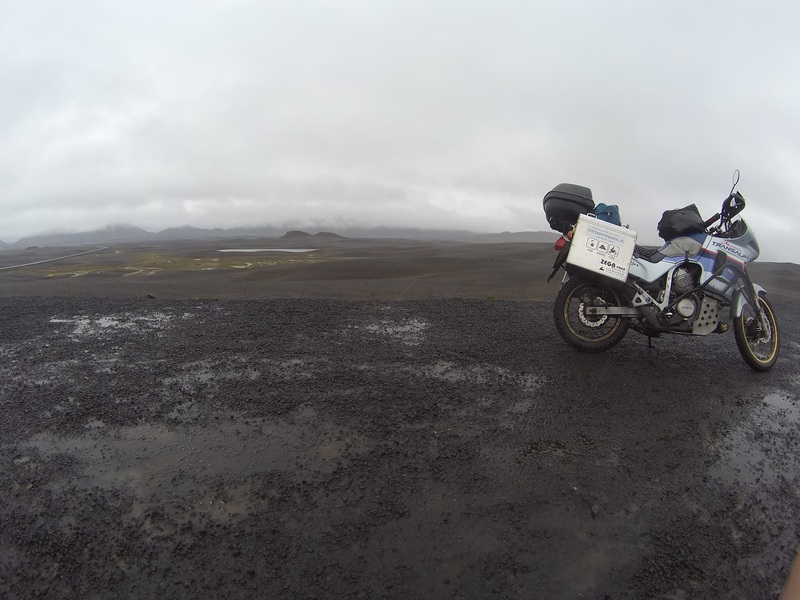 It might have had something to do with me taking a wrong turn and ending up on the Moon, though. 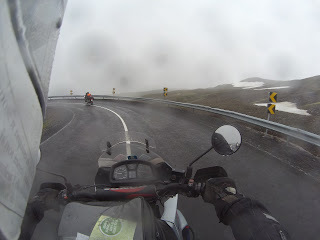 By this point I was getting rather cold. The heated grips were on full force and I was wearing 6 (!) 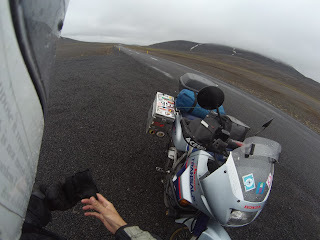 layers of clothing, but the wind coupled with the rain somehow managed to just cut through all of it. I had originally planned to see Detifoss, one of the largest waterfalls of Iceland, so when I came across road 864 that lead towards it, I turned off Road 1 and tried my luck. It was then when I noticed I'd apparently missed the fact that this particular road, as I was to find out later, was labeled on my map as 'unsurfaced'. After about 20 meters, the road changed into a gravel, potholed minefield. 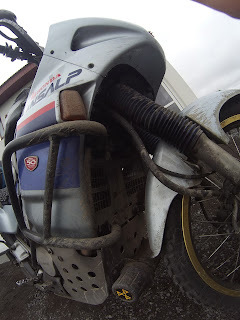 With my only gravel experience being 2 years ago somewhere in Albania, this required some getting used to, and I worried quite a lot whether the Beast was not going to crumble under the strain. When I arrived at the Grimsstaðir guesthouse though, all the Beast had was some extra warpaint. 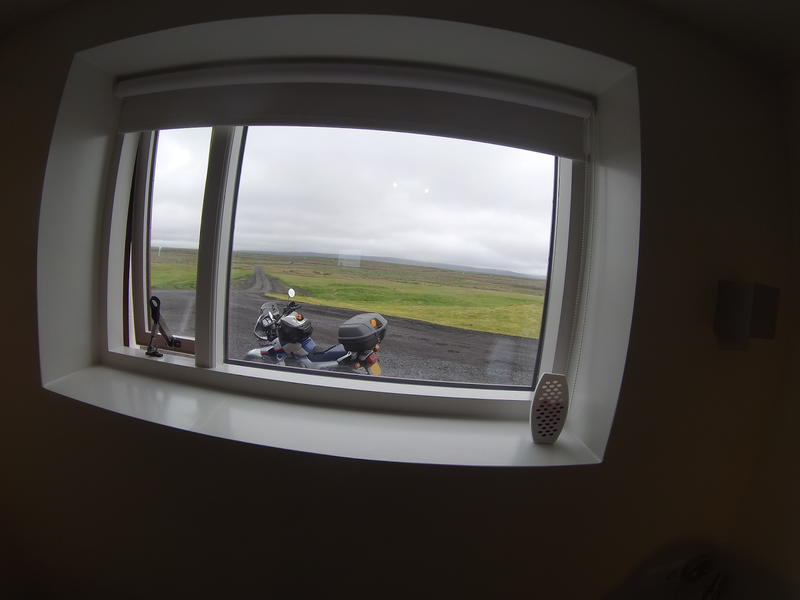 I'd picked the guesthouse for now because I just needed a place to warm up, and get everything that was soaked (my boots were still wet from the Faroes) dried up. The guesthouse though was a feat in itself. "Yes, we have a room" they said. 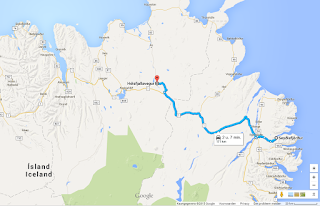 "but it is 5 kilometres away". 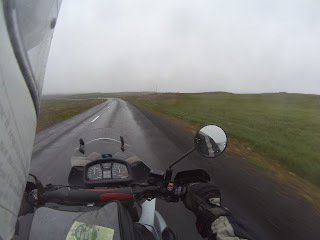 Apparently, I needed to go further down the road to Detifoss for 5 kilometres, and at some point I would come across a set of houses to my left. "The key to the room will be in the door". 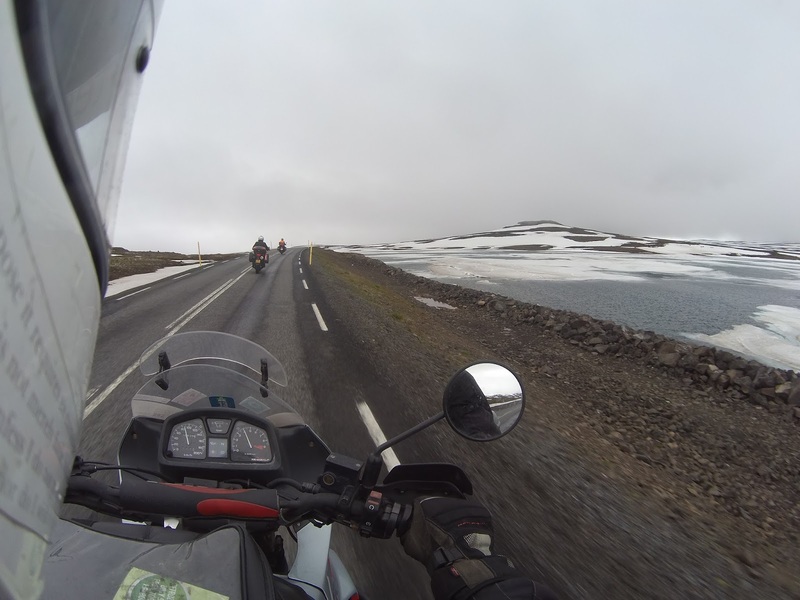 Not as boring as it sounds... at least not in Iceland! The Beast proudly displayed its new look, seemingly loving every minute of the mud bath it had just had. 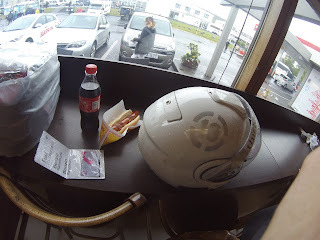 I took off all the gear, and moved inside where it was significantly warmer. 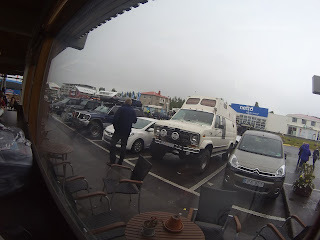 ...but there I was, in a room of a guesthouse 5 kilometres away from its reception desk, in a place that was (amazingly) indicated on my map as "separate buildings", with nothing around me (not even a phone signal) besides the Beast. 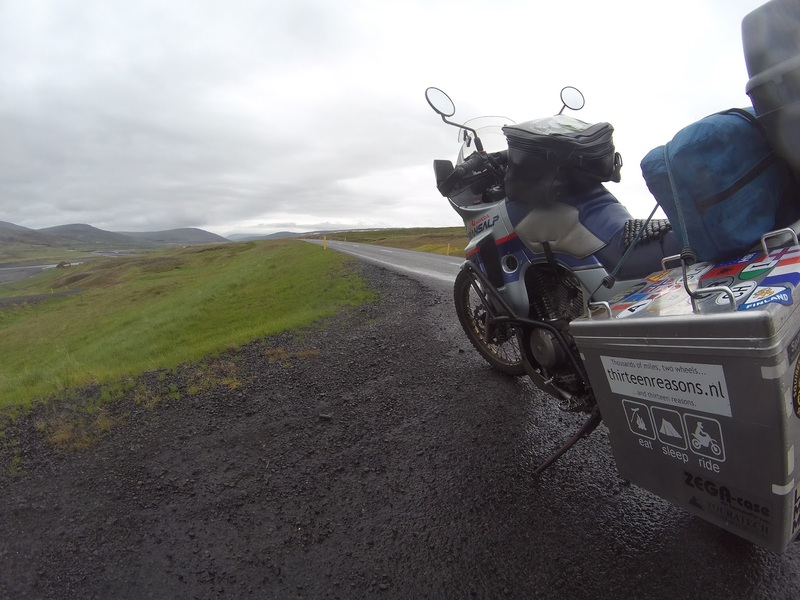 Into Iceland and ratchet straps conundrums!